I was trying to decide what to cover for this article, and realized that there is not much information out there about sea pens. These beautiful animals are occasionally seen in pet shops, but if there is any information about them provided at all, my experience has been that information is usually wrong. There’s a brief introduction to these animals in Eric Borneman’s Aquarium Corals book (2001), and a couple of pages in The Reef Aquarium, Volume Two (Delbeek and Sprung 1994), but in general these unusual corals are overlooked or omitted from all but the most detailed aquarium texts. Therefore, I decided to write this article to try to provide some useful information to people who are interested in keeping one of these amazing and unusual animals. I kept one in my office display at UC Davis for many years before I moved away, and found it to be a fascinating and rewarding addition to my tank. However, having said that, I also want tohave a strong warning right up front that these animals have a very poor history of survival in the aquarium. They should be only considered by experienced hobbyists with well-established tanks in which they also have a deep sandbed, and even then must be considered very difficult to keep. Sea pens are often mishandled and damaged during shipping, they have very specific needs in the aquarium, and they a sensitive and easily stressed. Therefore, while I am trying to present the best case scenario below for trying to keep one of these animals in the aquarium, you should also seriously ask yourself if your aquarium and husbandry skills are up to the challenge before you consider adding one of these animals to your aquarium! OK, now that I have that out of the way, let’s start off with explaining what exactly is a sea pen. Well, they are cnidarians and along with the true soft corals and gorgonians, they form the Subclass Octocorallia. Pennatulacids (the technical names for sea pens and sea pansies) are actually colonies of many polyps (like a coral head) rather than a single animal (like an anemone), and there is some pretty cool division of labor among the polyps (for details see Brusca and Brucsa 1990). When a larva first settles, it metamorphoses into “founder polyp” which becomes the stalk from which the other polyps in the colony arise via asexual proliferation (in much the same way that other coral colonies grow by asexual replication of their polyps). The colony is composed of a series of gastrozoids (the feeding polyps responsible for capturing food and nourishing the colony), and siphonozoids (respiratory polyps responsible for moving waterinto and out of the colony to allow for gas exchange). The entire colony is typically arranged into a bulb, which is buried in soft sediments (very fine sands and muds on the sea floor) and an exposed portion along which the remainder of the polyps are found. 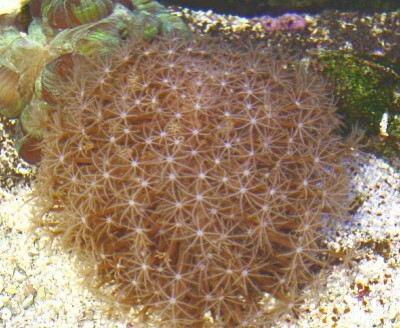 Individual colonies can consist of tens of thousands of individual polyps, and a large sen pen can easily have 40,000 or more polyps on it (Erhardt and Moosleitner 1997). Both the bulb and the upper portion of the animal are strengthened by an axial rod that consists of a mixture of hard organic material (like a gorgonian) and calcium carbonate (like a stony coral), but the animals are highly contractile and can expand or contract greatly depending on conditions. There are about 300 species of sea pens found in the sea, and they range from shallow waters surrounding coral reefs to the deep ocean at depths below 5000 m! Many of these species are colorful and capable of spectacular bioluminescent light displays inthe dark when disturbed (Erhardt and Moosleitner 1997). Although these displays are impressive to behold, you should never encouraged a sea pen to luminesce intentionally – the production of light is an expensive stress response that will lead to decreased growth and health of your animal if it happens too frequently. The “feather-like” shape of sea pens is an adaptation for increasing the spread of gastrozoids into the water column to maximize the prey capture rate of a colony while also minimizing drag in the turbulent water in which these animals are typically found. Each gastrozoid is capable of producing gametes for sexual reproduction but all polyps in a given colony are either male or female (Brusca and Brucsa 1990). Most of these animals spawn their gametes (both sperm and eggs) freely into the water column and fertilization occurs in the sea after spawning (Eckelbarger et al. 1998). Fertilized gametes develop to produce planktonic larvae that must feed and develop in the water column, so reproduction in the aquarium is highly unlikely. However, some in species only the males free-spawn, while the females hold onto the eggs and fertilization occurs internally. For these species, the females brood the developing embryos until they have reached an advanced larval stage, at which point theyare released into the water (Erhardt and Moosleitner 1997). These late stage larvae swim around for up to a few days, actively searching for an appropriate place to settle and metamorphose into a founder polyp. Once they locate an appropriate location, they settle onto the sand and metamorphose into an elongate polyp that will eventually form the axial stalk (the elongate rod on which the remainder of the polyps will grow), as described above. For these few species that brood their young, reproduction in captivity may be possible, but to the best of my knowledge, no one has yet bred sea pens in captivity, either through sexual or asexual reproduction of the coral. How Do Sea Pens Make A Living? OK, so having explained what a sea pen is, now let’s talk about how they live. There are many different species of sea pens out there, but the most commonly imported for the aquarium trade is Cavernularia obesa (Borneman 2001). I have overheard pet shop employees explaining the specific lighting requirements for keeping this specific sea pen in the aquarium on many occasions over the years. I have to grit my teeth each time I hear that, because despite the fact that this particular sea pen is a rich brown color similar to many zooxanthellate corals, they do not have any symbionts. In fact sea pens in general lack photosynthetic symbionts, and as a result are generally uncaring of lighting conditions (Erhardt and Moosleitner 1997). Furthermore, many (if not most) sea pens are nocturnal (active only at night) and even the species that are expanded during the day are unlikely to be bothered by whatever your ambient lighting happens to be. Given that they arecompletely nonphotosynthetic, it should be simple to deduce two things: 1) lighting needs are probably not a big concern, and 2) they need to be fed! In this case, not only do they need to be fed, but they need to be fed quite a lot. These animals typically prey on an abundance of tiny plankton (such as invertebrate larvae, suspended detritus and larger phytoplankton), and their efficiency of capturing such particles is directly influenced by the flow rate of water in the aquarium (Best 1982; Best 1988). I’ll come back to the specific types of food in a while, but first I’ll talk about how they actually feed. These animals typically live in regions of relatively high and constant flow, and without such conditions their ability to feed is dramatically hampered. So, there are really two critical factors to keeping one of these animals successfully. The first is that you need to provide the appropriate food, and the second is that you need a consistent and relatively strong bulk water flow for these animals to really flourish. These animals require a large amount of water moving past them consistently to be able to feed properly,and that does not mean simply having a powerhead pointed in their general direction. Richard Harker has an article on turbulent water flow in the reef aquarium online if you’re looking for more information regarding water flow in captive reef aquaria. I won’t go into detail on the issue of bulk water flow in the aquarium, but suffice to say that without a substantial amount of ambient flow past these animals, it won’t matter whether they are fed or not – they need the flow to effectively capture their prey, and without it they will starve even if there is plenty of food in the aquarium. These animals are found most commonly in areas that have moderate flow rates. So to make that into something concrete for you, something on the order of 5-10 cm/s of bulk water flow would be a reasonable guesstimate for the conditions you should be trying to duplicate in your aquarium to keep one of the species commonly imported for the hobby alive in your aquarium. The other important consideration besides the water flow rate is the particle size and depth of the sediment bed in the aquarium. The majority of sea pen species require 20 cm or more of muddy sand in which to bury their “foot” (as I explained above, this is really a highly modified polyp that provides the attachment point for other polyps in the colony) or they will not be at all happy in your aquarium (I’ll come back to this below). Crushed coral (especially stuff in the 3-5mm range) is simply too coarse for the animals to borrow, and if it tries to burrow at all (which I doubt), it will likely fail or injure itselfdue to laceration of the bulb by this coarse sediment. Most sea pens seem to go through a period where they extend fully on top of the sand before burying into it completely, so seeing a fully expanded sea pen on the bottom of your dealer’s tank is generally a good sign. Because the animals are rarely given appropriate habitat in a petshop, a fully expanded animal is the best you can hope for: even if it is not buried in the sediments yet, a fully-expanded sea pen is more likely to be reasonably healthy and likely to try burrowing if presented with the proper conditions in your tank at home. Furthermore, if the sediments are too coarse or the flow too low to be “rippled” by the currents in your tank, then the conditions are likely not appropriate to keep a sea pen. In experiments in nature where researcher put out trays of various sediment size to look at colonization of infauna (sea pens were one of the groups considered), they found that areas with finer sediments that weredisturbed slightly by the currents had the highest rate of infaunal colonization and the greatest density of animals (Levin et al. 1994; Levin and Dibacco 1995). 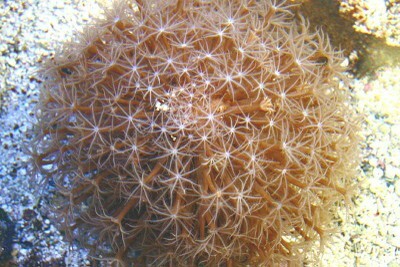 Although some species (such as the unusual Cavernularia, which looks more like a bottle brush than a typical sea pen) could thrive in a bed as shallow as 3-4″, and with particles as coarse as sugar-sized sand, most species need at least a full body length (and something closer to 1.5-2 body lengths of the fully extended animal is probably better for them) of very fine sand or mud for them to burrow and establish properly. A sea pen with too shallow or too coarse of a sandbed will show a characteristic behavior of curling up on the bottom of the aquarium rather than burrowing in (Erhardt and Moosleitner 1997). They may also expand and float dangerously around the aquarium, where they are often stung by other corals and may be sucked into a pump intake. In either case, a sea pen that does not stay put is a major danger to itself and to your aquarium. Although a sea pen is unlikely to sting another coral and seriously injure it, they do produce a variety of nasty chemicalsthat they use to defend themselves. Many of these compounds are unknown in function, but some have been shown to have antimicrobial, cyto-toxic or other effects, and at least one looks to be useful in the treatment of cancer (e.g., Wratten et al. 1977; Hendrickson and Cardellina 1986; Datta et al. 1990; Fu et al. 1999; Chen et al. 2001). Many of these compounds have also been shown to be highly toxic to brine shrimp or fish in aquaria, and are unlikely to be good for your animals in your aquarium if the sea pen is being damaged by bouncing around the tank being stung and/or injured by pump intakes. As I said above, most of these animals feed on a variety of tiny plankton such as invertebrate larvae, rotifers, ciliates, suspended detritus, bacterioplankton and probably phytoplankton as well. To date, there has been no research to show whether or not these animals capture and digest phytoplankton, so the best I can offer you is a guess that they do, based on observation of my single sea pen in my tank in Davis. Obviously that is not very reliable evidence and until someone conducts a study along these lines, I will leave it at that – a guess. However, almost every reference I have mentioned in this article (Delbeek and Sprung 1994; Erhardt and Moosleitner 1997; Borneman 2001) suggests that you feed enriched brine shrimp to your sea pen , and you’ll probably notice that I did not include newly hatched brine in this list (enriched or otherwise). That is because my experience with this species suggests that even newly hatched Artemia nauplii are too large for the animalto eat. I feed my aquarium with newly hatched brine on a regular basis for years, and never once saw my sea pen capture a baby brine shrimp in my tank. I definitely saw it capture and appear to ingest a variety of other foods with smaller particle sizes in my tank, so I am assuming that at least my sea pen was feeding entirely on smaller prey than baby brine shrimp. Like most particle-feeders in the sea, sea pens are adapted to feeding almost continuously while fully expanded. That means that almost all such animals do best when offered a small amount of food on a very regular basis rather than a huge dose of food once in a while (Toonen 2000). However, that is rarely how people feed their tanks – most people dose their tank heavily with food every few days rather than using smaller amounts two or three times per day to try to simulate continuous feedings. Heavy feedings at irregular intervals are not the best strategy for any suspension-feeding animals, and tends to increase the likelihood that some food goes uneaten and contributes to a decrease in water quality. Thus, whether it is a sea pen, a feather duster or a bivalve that you are trying to feed, you’re almost always better off providing smaller feedings on a more regular basis than dumping large amounts of food into your tank once in a while. The prepared foods are obviously the easiest choice to provide on a regular basis, but enriched rotifers can be easily cultured or purchased from many sources now, and ultimately a variety of food is always preferable to any single food item to ensure the long-term health of your animals (Toonen 2003). By providing the proper sized particles and a healthy mixture of food for your new critter once it establishes itself, you’ll give it the nutrition that it needs to thrive in your aquarium. Levin LA, Dibacco C (1995) Influence of sediment transport on short-term recolonization by seamount infauna. Marine Ecology Progress Series 123: 163-175.